A has been bothering me to go blonder almost ever since we started dating, which was why I dyed my hair a blonde ombre at first as seen here and then got blonde highlights for my wedding as seen here but it evidently wasn't enough because he asked me to go blonde yet again while I was home on maternity leave. So I decided to just go full on blonde like he wanted so he can see how it actually doesn't look very good on me and never bother me again. I know this seems like a huge thing I'm doing just to satisfy him but it's also to save my sanity since I'm sure he would have bothered me about it every year if I didn't do it now, which is the best time to do it before my baby can see all too clearly. :) After doing as much research as I could - there's not much out there on blonde asians - I made an appointment! Dress: Shein Black Long Sleeve Casual T-Shirt Dress mentioned here. Jacket: Caslon Knit One-Button Blazer mentioned here. Shoes: Madewell Sidewalk Skimmer. Bag: Boohoo.com (old but also mentioned here). Surprisingly, it wasn't as terrible as I thought it would be on me but this took 7 hours and the burning of my head and nose and eyes to get done. I wasn't sure if it was possible at first to go from black hair (that was box-dyed brown recently) to full on blonde but it worked! 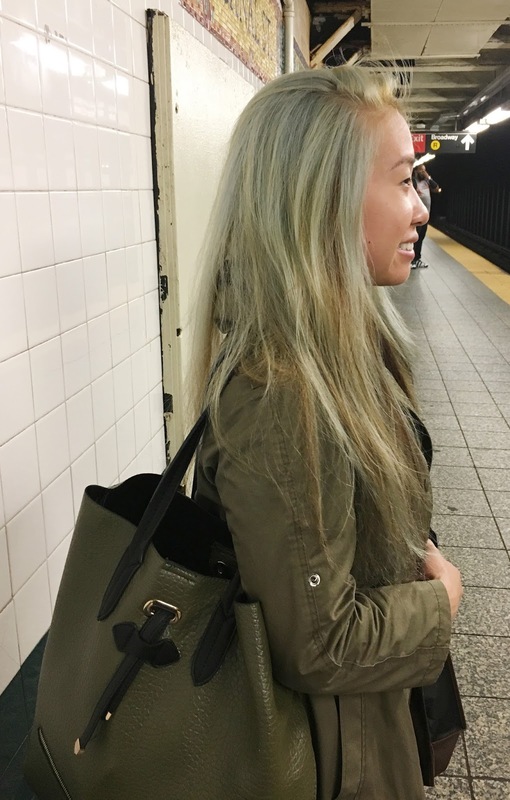 My stylist was very hesitant because he wasn't sure if my hair could handle it, which is why it took so long, but after two bleaching sessions, toning, reverse toning, and adding dark lowlights, I was blonde! However, it wasn't until after I left the salon that I realized the top part of my head was much more blonde and lighter than the bottom. This gave it a cool reverse ombre effect, but was not what I was looking for, though I did love the bottom very much with its ashy blonde color and black lowlights. I went back a few days later wanting to fix the top so it was more like the bottom but had to get it completely redone instead, which took another 3-4 hours. Jacket: Burberry (old but cure one here). Bag: Boohoo.com (old but also mentioned here). Coat: Shein (old and mentioned here). Tights: H&M Opaque Tights. Shoes: Nine West (old but similar here). 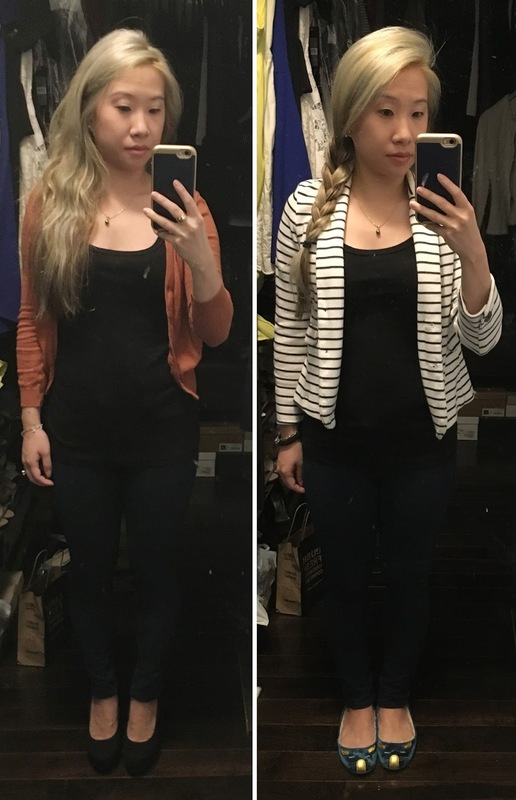 From left to right - Cardigan: Urban Outfitters (old but cute similar here). Shoes: Payless (old but simlar here). Tank: Splendid Ribbed Tank. Jeans: LOFT skinny legging jeans (old but similar here). Blazer: Old Navy (old but similar here). Shoes: Marc Jacobs (old but similar here). 2. Combine flour with baking powder and salt. 3. Use a pastry cutter or two forks to combine your solid coconut oil (solid but soft and not hard), until it reaches an even, crumbly texture. 4. Stir in milk and mix to form biscuit dough. 5. Roll out dough until it's about 1/2" thick. Use a sprinkling of flour on your rolling pin and board to prevent sticking. 6. Use a biscuit cutter or small cup to cut out biscuits. Re-roll dough until all biscuits are cut. 7. Line a baking sheet with parchment and spray with oil. 8. Place on baking sheet and baked for 10 minutes.